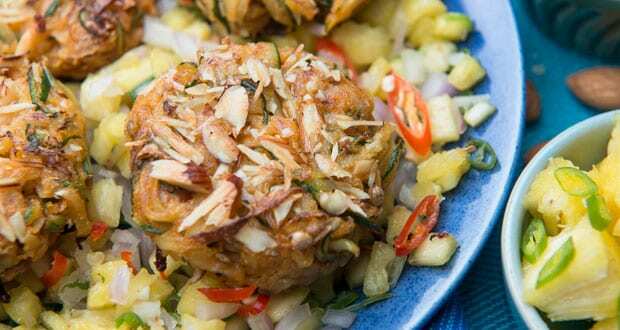 About Badam Papite Ke Kebab With Pineapple Salsa Recipe: A delicious and healthy snack option to make at home with few easy steps. A guilt-free kebab recipe to relish with friends and family, made with raw papaya, potato, almonds and a host of spices to spruce it up. Served with a mouth watering pineapple dip, this is a complete party starter appetizer! 1.Apply salt to raw papaya and potato and leave aside for 5 minutes.Now press them to release water and put them on a paper towel.Place them in a large bowl and add all the ingredients, except the oil. 2.Mix well and shape them into rough, thin patties. 3.Heat oil in a pan and place the patties in medium hot oil. Cook till the bottom caramelizes and then carefully turn the patties. Cook them till they are crisp from outside. 5.For the pineapple salsa, mix all the ingredients and serve with the kebab. My husband says mmmmm yummmmmie!